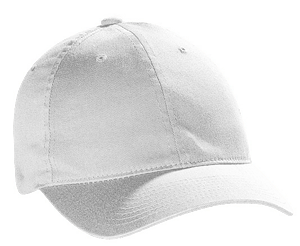 - Flexfit® Low Profile Garment Washed Cotton Cap. - Cotton washed twill, high quality premium spandex cotton twill. - Low-profile shape, 6 panels, 3 1/8" crown, lightly structured. - Garment washed for vintage appeal. Flexfit® Low Profile Garment Washed Cotton Cap. Cotton washed twill, high quality premium spandex cotton twill. Low-profile shape, 6 panels, 3 1/8" crown, lightly structured. 98/2% Cotton/spandex. Matching undervisor. Garment washed for vintage appeal. Sizes: S/M, L/XL. Colors: White, Black, Khaki, Loden, Navy, Orange†. Sizes: S/M: (6 3/4”-7 1/4") L/XL: (7 1/8"-7 5/8"). †Limited quantities.